The following picture shows the actual monument over Smollett’s grave in the Old English Cemetery of Livorno, as it is now. The New Bon Ton Magazine or, Telescope of the Times, August 1st, 1818, p.204. The London Literary Gazette, n.86, Sept. 12th, 1818, p.590-591. The European Magazine and London Review, vol.76 (Jul.-Dec. 1819), p.512. Situated on the banks of the Arno, between Leghorn and Pisa, in the most romantic spot that even the vivid imagination of an Italian could select, rises the tomb of our countryman Smollett, the author of Roderick Random, &c. It is of a plain octagonal form about thirty feet in height, and six feet in diameter at the base which forms an apartment, to which there are three doors. The English who visit it from the port of Leghorn, have erected a plain marble table, surrounded by stone seats within, and scarce a vessel arrives, but the officers and crews pay a visit to Smollett’s tomb, and do homage to his memory in sacrifices of the finest fruits and copious libations of the most generous “lachrymae christi” wine. He knew every thing – he loved every one. A Terence and a Boccaccio. then let thy tears of rapture flow. and painted man as he should be. Enshrines in death the man of worth. This article was also printed in The Gentleman’s Magazine, September 1818 (p.267). “(…) When he [Smollett] arrived at Leghorn he was hospitably received by all the British in the place, and the Grand Duke of Tuscany ordered him apartments in a palace near the sea-side – there he experienced a state of convalescence, and began to hope for a longer extension of his span. He removed from the city, where the fame of his merits brought him too many visitors, to a neat cottage on the banks of the River Arno, about nine miles from Leghorn, there he amused himself with reading, and wandering on its flowery banks for two summers. He was too weak for attempting any literary composition; and without any symptoms of having grown worse, he died as calmly as he wished. His old domestic found him on a turf seat, which stood under a fig tree, surrounded on three sides with flowering shrubs, leaning his head against the tree, with a book in his hand, and quite dead. The first Novelist of his age. The plate represents his tomb as it stood in the year 1790; but in the desolations that have visited unhappy Italy, his tomb – the grave of genius – did not escape devastation. A great part of it is now thrown down, and the ruins are every where twined round with laurel and myrtle. When the French occupied Leghorn, Smollett’s tomb was the head-quarters of a subaltern, who lived in it, and his small party in the cottages adjoining. There is a stone table in the centre, around which twenty persons may conveniently sit, and the roof is 10 feet high; the door is large, and the silver Arno flows majestically by, about fifty yards from the front. When the British fleet, commanded by Lords Hood and Hotham, made Leghorn roads a rendezvous, it was the fashion to make parties up the Arno, and dine in the tomb of the British novelist. Sometimes twenty officers have sat down, and fired their pistols as a requiem over his grave, when they toasted his health. Smollett’s tomb has been the scene of much festivity:- a Scotch sailor, belonging to the Diadem, Captain Towry, was taken thither with his sweetheart, by the officers, and married in the sepulchre of genius. A dance and a feast ensued; and had Smollett been able to pop his head above the earth, he would have witnessed a scene worthy of the most brilliant touches of his quaint and humourous pen; for no man ever portrayed sea characters to the life more truly and pleasingly than he did. When Lord Byron lived at Pisa, he often visited this most romantic spot – so dear to every free-born Englishman; and it is much to be wondered at, that he never strung his lyre, and breathed an anthem to the memory of a kindred soul. His Lordship, no doubt, wrote much which has not yet seen the light, and never may; for I cannot persuade myself he would let such an opportunity escape of paying a tribute to the worth of a poet, a novelist, and a historian. In 2011, during my research visit to the National Archives, I stumbled upon a modern (1957) typescript transcription of a journal dated much earlier. The document, conserved among the Foreign Office Papers (FO904/13), described a visit to the Old English Cemetery of Livorno made by the author together with other people (Dr. Peebles, Lady Belmore, Miss Caldwell and the two Miss Swinnerton). It is possible to approximately date it because of the following sentence: “…we paid a tribute of respect to the mould which covers the remains of Francis Horner. His monument has not yet been erected, but a simple marble slab protects his revered dust in the meanwhile (…). I made the following sketch of the spot. (The stone on the left covers the grave of two sisters, Frances and Louisa Jane Drewe (…) who died (…) the 19th of March, and (…) the 10th May, 1817. Both (…) had attended Mr. Horner’s funeral.)“. From this passage we can definitely say that these people visited the cemetery after May 1817 and before 1820, year in which Francis Horner’s brother received the medallion portrait he had commissioned in 1817 to the sculptor Chantrey for his grave in Livorno. 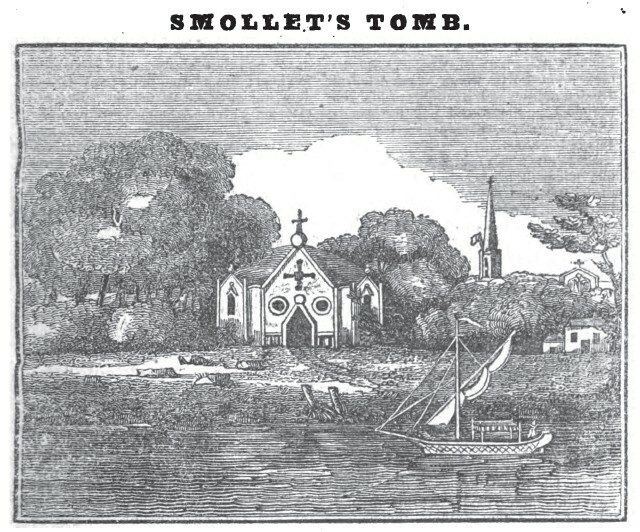 This date is important for the next passage regarding Smollett’s tomb: “The ingenious Dr. Smollett died at Leghorn and his remains are interred here. But he was without a monument until several gentlemen amongst whom were Mr. Grant and Mr. Hall, joined to pay him that tribute. His is of white marble, and simple and beautiful in its form. (…)“. The Buchan Telfer-Carmichael dispute over Smollett’s grave can certainly provide a few interesting hints; for instance, Carmichael suggests that Smollett’s entry on the burial register of Livorno’s protestant community was added by Rev. Thomas Hall after noticing it was not entered at the right time by his predecessor Rev. James Haggarth. Hall, as Carmichael says, must then have copied the date from the monument inscription, and this could have happened only after 1783, when he became Chaplain at Livorno. There’s no proof that the monument existed long before this date but if Carmichael is right, then it definitely existed sometimes after 1783 and before 1824 (Hall’s death). It is also to be considered that Smollett’s wife was living in Livorno until her own death in 1791. Is it realistic to think that a monument would be erected over her husband’s grave with a wrong date while she was still living there? Maybe not, and so it might have been erected after 1791. 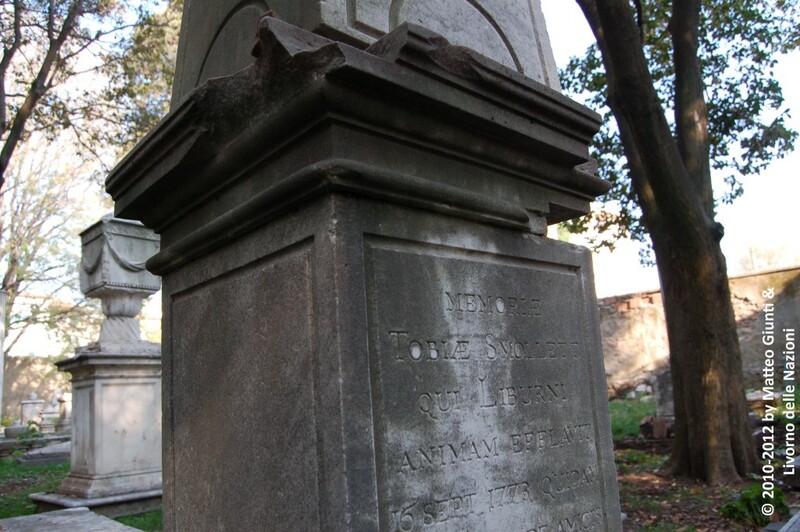 The anonymous journal cited above would confirm this hypotheses adding the important detail that Smollet “…was without a monument until several gentlemen amongst whom were Mr. Grant and Mr. Hall, joined to pay him that tribute“. The Mr. Hall and Mr. Grant are, most certainly, the reverend Thomas Hall, and one of the Scottish brothers Grant, either Isaac, who established himself in Livorno in the late 1780s, or John, who joined him later. Col. Buchan Telfer, in his answer to Consul Carmichael, adds that he had a letter dated 1882, from his old friend Mr. Alexander Macbean (British Consul in Livorno 1843-1883) stating that his “recollection of the obelisk dates back fully sixty years…“. This would demonstrate that the obelisk was there before 1822, but we have to believe that a 9 years old Alexander Macbean would have remembered this fact 60 years later! Buchan Telfer adds also that there’s evidence that the obelisk existed already in 1816, but unfortunately he does not reference his statement. In the letter from Dr. Gaspard Marcet to Leonard Horner (brother of Francis) dated from Florence the 5th March 1821, he says, speaking about his very recent visit to the cemetery: “(…) Thus I very unexpectedly fell in with Smollett’s tomb (…)”. After all these arguments, it would make sense to think that Smollett’s grave in the Old English Cemetery of Livorno was probably made between 1791 and 1806, but what about the mysterious octagonal mausoleum “on the banks of the river Arno”? No convincing proof, until now, has ever been found to demonstrate its existence, but the fact that Smollett might not have had a monument in the cemetery for maybe 20-35 years after his death, could indicate that the mausoleum existed. One Response to On Tobias Smollett’s grave(s)… Reality or poetic licence?